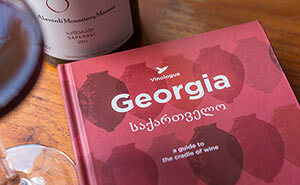 We is pleased to announce the release of our newest title, “Georgia: A guide to the cradle of wine“. It was officially presented on June 9, the opening day of the 10th annual Winexpo in Tbilisi, Georgia, followed by a Q&A session with the authors at the popular Amber Bar in Tbilisi’s exciting Left Bank neighborhood. The recipient of the Vintner Guild’s prestigious Geoffrey Roberts Award in 2016, the book is the culmination of months of research across the entire country of Georgia. The resulting book is 300 pages in length, with countless full color photographs, extensive maps, cellar listings, and a lovely hardcover binding. As with the other books in the Vinologue series, the book focuses on helping anyone from first time visitors to experienced wine professional navigate the ancient and at times exotic nature of Georgian wines. While there is a special emphasis on the production of and use of the ancient terracotta pots called kvevri, the book also delves into the production of wines in the more international methods of stainless steel and oak, as well as everything that comes in between as the Georgians are continually experimenting given the modern upswing in interest for their wines. The book’s two authors are experts in their relative fields. Miquel Hudin was the recipient of the Fortnum & Mason Award’s Best Drink Writer of 2017 and is a Certified Sommelier who writes for countless international wine publications. Daria Kholodilina is based in Tbilisi and is a local food and tourism expert. The book is available for immediate purchase from our online shop with shipping around the world or via Amazon.